I’m sure that thousands of pages have already been written about the beauty of this town. I am sure that many people who visit Venice often come back to this place a second or a third time. And I am sure that many of you have memories from this place. When I reached Venice this year, in February, I went there to see the famous Carnevale. It was my second time in Venice but it was there and then when I liked this place. I was already toying with the idea of opening a blog and I started getting more into photography so a trip to this lovely place filled with people, masks and costumes sounded appealing to me. After checking in at Albergo Minerva e Nettuno I started walking on the streets, admiring the canals and the gondolas. Watching the old buildings and eating some delicious little pastry pieces while looking for new places to see and photograph. Because you see, Venice is the kind of city where you always discover something new even in the places you seen before. I marveled at the beautiful outfits done for the Carnevale and I walked on the small, narrow streets until I reached Libreria Aqua Alta where I saw one of the world’s most unusual and special bookstores. As my steps took me to Piazza San Marco the crowd grew larger and large, thousands of tourists mixed with costumed men and women walking, sitting in line to enter Basilica di San Marco, gondolas moving the tourists who wanted a sweet memory along the canals and in one part of the Piazza, quiet and solemn from the outside sat Caffé Florian. So, after admiring the gondolas and the water, after seeing Ponte dei Sospiri I walked slowly towards Florian looking for a coffee. Now, I usually don’t drink or eat in central/famous places but I made an exception because of the history of this place. First of all this place was opened in 1720. Yes, you read the numbers right. 1720. So you can imagine my curiosity of entering a building, a place that functioned for 297 years. 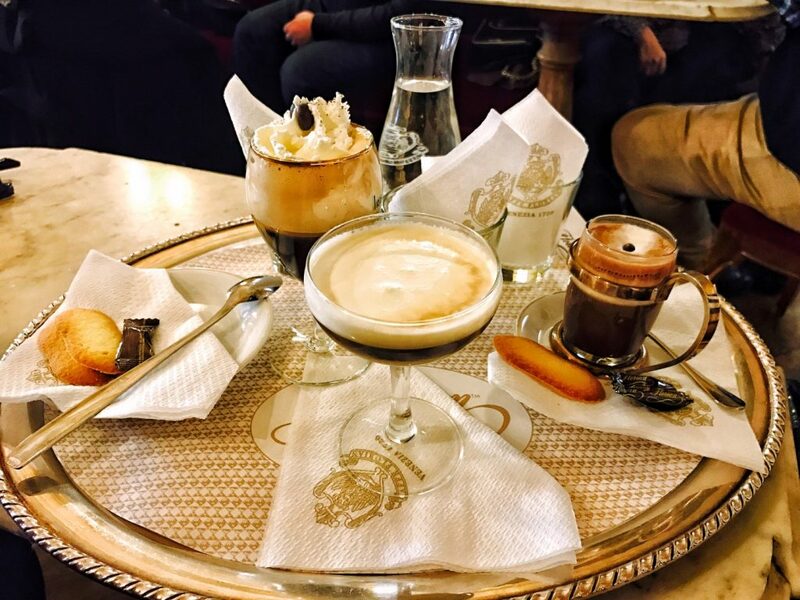 Frankly I have a thought of coming back to this place on the 29th of December 2020, the date when Caffé Florian will celebrate its 300th year. Second of all, this place is the oldest coffee shop in Europe. Not just Italy but whole Europe. So when reaching its doors I was not surprised to see a pretty long queue waiting to enjoy a cup of coffee inside this establishment. I don’t know if it luck or people just drink their coffee, grab a small bite to eat, talk and leave but despite the fact that I had like 15 people before me I managed to get inside in about 10-12 minutes. I was lead to a small table and while I did not get the chance to walk on the entire place I can say without a doubt this is a big place. Lots of staff present, nicely dressed, moving fast between the customers, bringing coffee or cleaning the empty tables for the next customers and I don’t know if it was my luck but I had a very pleasant man taking my order and helping me decide what to drink. As I said before I am no coffee drinker so you can imagine me looking at a very large menu wondering what should I taste. I decided on something with alcohol (being cold outside you know) and took my time in looking at the people around me, at the queue outside, at the place and its decorations. Now before reviewing the drink you must understand that I did not came here just for the coffee. Places like this are rare and they have a certain feeling about them. They have witnessed history (this place functioned as a place for treating the wounded during the 1848 uprising). 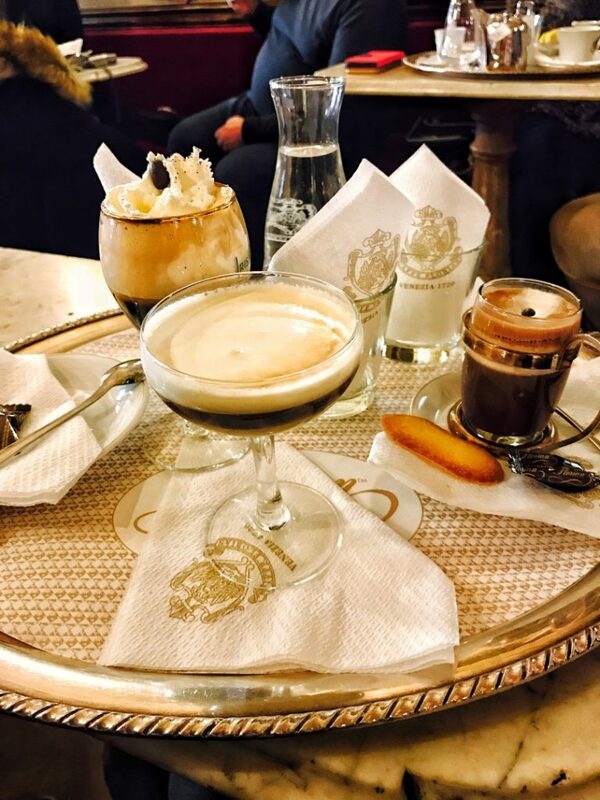 I dare to say Caffé Florian is more about history, of tasting a bit of it, of seeing a building that witnessed so many events in almost 300 years of life than the coffee. The coffee was good and I was happy with my selection but for me that place meant more than a random drink from the menu. It meant being in a place where the likes of Carlo Goldoni, Lord Byron, Marcel Proust, Charles Dickens, Goethe and many others stood and enjoyed their coffees and admiring the beauty of Venice. Giacomo Casanova also. Why not? Let’s add him to the famous visitors too because after all Caffé Florian was the only place at that time that allowed and admitted women inside its premises. So you can see how this place means more than just coffee. Yes, the prices are higher than usual. Yes, you can pay up to 15 or more euros for a coffee but this is one place where I didn’t mind paying that sum. So maybe, maybe on the 29th of December 2020 I will see this place again. Who knows? Earplugs or how I missed having a good pair in Athens.